This was the moment, then, when Rumi began fathoming Allah not just with the mind but also with the heart. In a world of sharp binaries, Rumi’s admirers seem bent upon separating Rumi the man of knowledge, from Rumi the mystic poet. In reality, the two are not mutually exclusive; in reality, both are the same person. As I recently travelled by bus in Turkey from Antalya to Konya, the city of the 13th-century Sufi scholar, its unusual and diverse landscape reminded me of his message that is so universally appealing — to the rich and the poor, the pious and the sinner, the scholar and the unlettered. 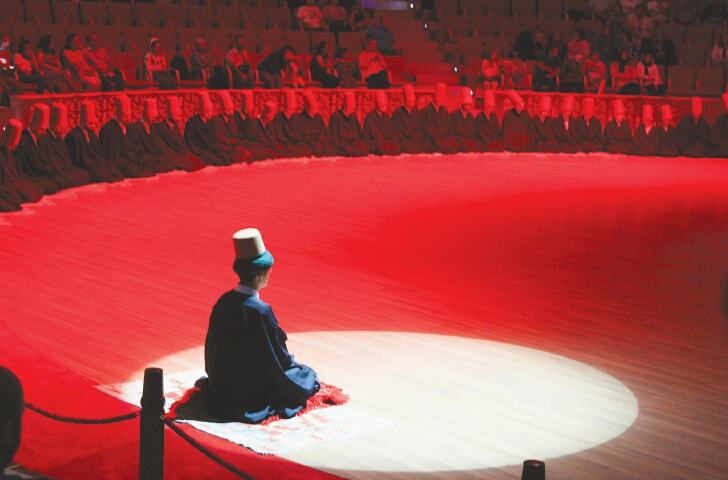 While the pluralism in his message is prominent, one thing becomes clearer than ever when you visit Konya — that Rumi was not just a Sufi, he was also a Muslim scholar, and taking that away from Rumi is telling half the truth. 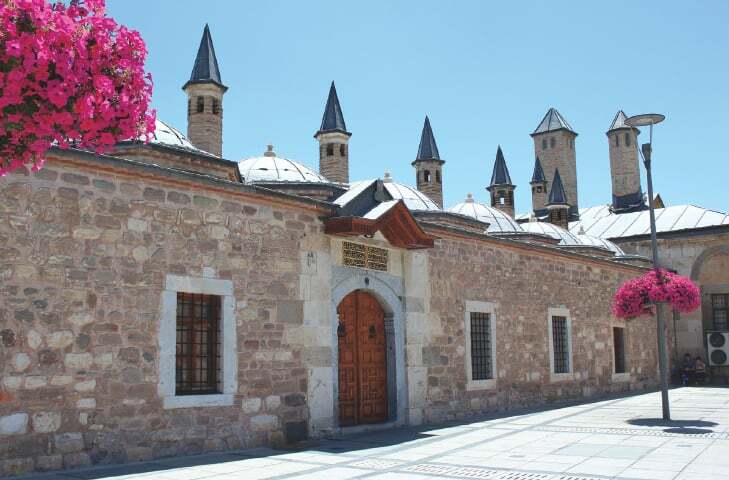 Konya has distinct old-world charm. The people are kind and the roses are abundant. 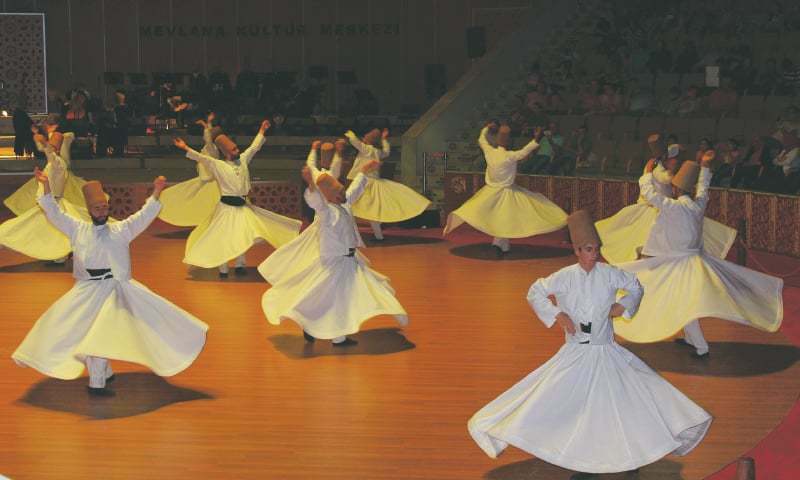 But the highlight of a visit to Konya is the Mevlevi Sema, a mystic religious rite practiced by dervishes, who emulate the whirling of Rumi, lost in ecstasy. It is an enchanting experience, the kind that leaves you with goose bumps. 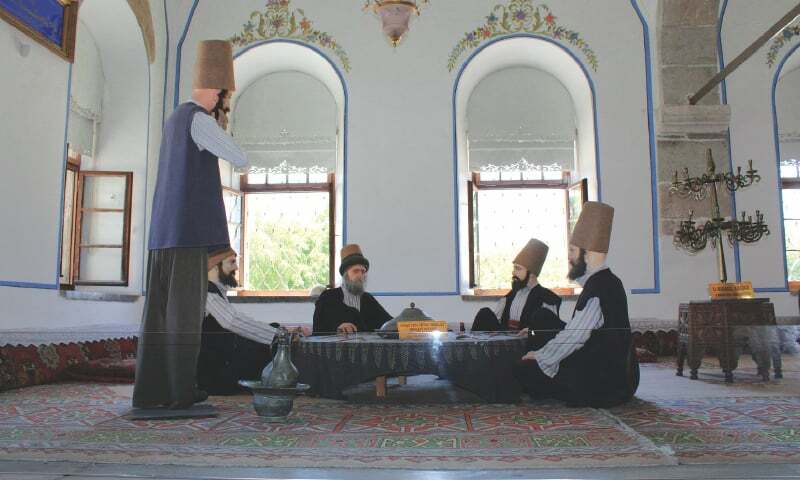 In the courtyard of the Mevlâna Museum that houses Rumi’s shrine, a common sight is a teacher with a flowing beard, a rosary in hand and a smile on his lips, sitting under the shade of a tree, surrounded by students learning about Islam. Calligraphy from Quranic verses are put up alongside verses from his extensive, famous poem, Masnavi. The sound of the azaan is loud and clear in Konya. Imprints of traditional Islam in the district where Rumi rests do not seem to disagree with imprints of Sufism. There is an honorary grave of the Poet of the East, Allama Iqbal, near Rumi’s grave. Iqbal is often called a spiritual protégé of Rumi, and is reported to have had a metaphysical experience when he felt Rumi’s presence. The popular interpretation of Rumi does not do justice to where he came from. Rumi is a mystic all right, but he is more than just mystic pulp fiction, and the Masnavi is more than just couplets that can be used to soothe the after-effects of a lovers’ brawl. Yet, few of those smitten by the universality of Rumi’s poetry recognise the visible imprints of verses of the Quran. The popular reductionist approach towards Rumi has reduced his poetry to memes, and selected couplets with aphorisms that are easy to quote. There is religion and there is religion, he says, and to Husain, the distinction is clear. “Religion puts before us deeper questions like ‘why are you here’, whereas religion also is focused more on rituals and minor details. We can’t see the wood for the trees,” he says. But there is no denying that Rumi has been re-popularised. And his fandom is not limited to Muslims, because his message was and is universal. “I love that Rumi sees Divine beauty in all aspects of creation and speaks to people of all cultural tastes and perspectives. I love that he uses bawdy tales in his poetry,” says Laury Silvers, a lecturer at the University of Toronto’s Department for the Study of Religion. According to Silvers, Rumi explains the most difficult of concepts by translating them into easily understood simpler concepts that help everyone own him. “Early on when Rumi was translated into English, these parts were translated into Latin so that only the most elite, scholarly fellows could enjoy them — exactly the opposite of Rumi’s intention in composing these verses,” she says. For some today, their first exposure to Rumi has been through the Turkish writer Elif Shafak’s book Forty Rules of Love. In a sense, Shafak did a service by producing an easy version of the often complex themes of Tasawwuf for her readers. Although Husain sees this as positive, he recommends graduating to books such as Me and Rumi: The Autobiography of Shams-i-Tabrizi by William C. Chittick for those interested in understanding Rumi better. Whether represented in a complex or an easy manner, Rumi remains the bridge we need today — he bridges the gaps polarisation has created. Those who cling to the more comfortable and less demanding interpretation of the spiritual path of love for God and those who hold on to the path of adherence to Islamic jurisprudence or Sharia as the road to Paradise — both can find something to guide them. In a world torn apart by extremes, Rumi’s message of love of God can be a meeting-point. Posted in Culture, Faith, Travel Blogs and tagged Culture, dawn.com, Kony, Mevlana, mysticism, Rumi, Shams Tabriz, Sufism, travelogue, turkey. Bookmark the permalink.